A group of Colorado College students is tackling the hunger problem — and one of their first steps was to change the corporate policy of a $700 million company. 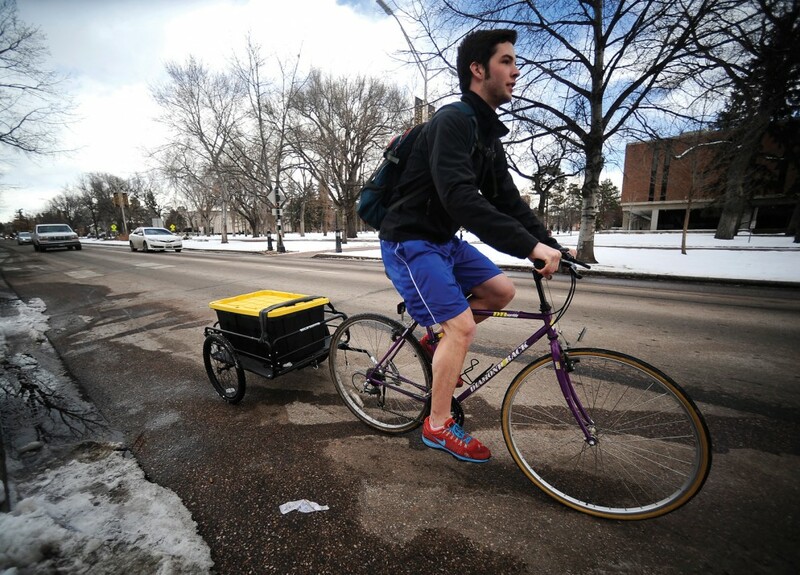 The founders of the Colorado Springs Food Rescue, Shane Lory ’16, Sanjay Roberts ’16, and John Orrell ’16, began biking unused food from Rastall Hall to the Marian House, a nearby soup kitchen, early in the fall of 2013. CC food supplier Bon Appétit, which provides café and catering services to more than 500 corporations, colleges, and specialty venues in 32 states, has food donation programs at its locations; however, food that had been put out for self-serve could not be donated. The students worked with Bon Appétit to revise its corporate policy, and early this year the company made the change. Now, food items, such as those in a self-serve buffet, can be donated to hunger-relief efforts in states where it is legally permissible. 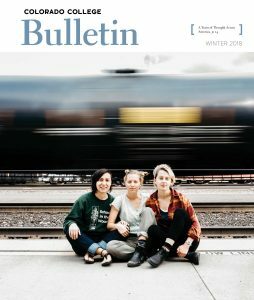 “We are grateful for the students’ initiative and willingness to work through this issue with us; it is a true testament to the power students have to change the food system,” said Claire Cummings, waste specialist with Bon Appétit Management Company Foundation. “It is wonderful that we can take even more food out of our waste stream and get it to people in need in our community,” she said, noting that the CC students have helped make recovering more food possible for Bon Appétit accounts around the country. The nonprofit has made a big difference in other ways as well. By the time the second semester began, the cadre of volunteers had grown to more than 30 students who regularly bike the food donated not only from Rastall, but also five restaurants and a grocery store, to Springs Rescue and the Marian House. The students bike to help reduce the organization’s carbon footprint, and have delivered more than 5,500 pounds of food to date. Donated items typically include fresh produce, baked goods, and prepared hot foods. A Block 5 fundraiser raised approximately $4,000. The proceeds will be used to purchase new trailers, bikes, and bike locks; in December two trailers and two bikes were stolen from outside Rastall, setting the group back approximately $700. Proceeds from the fundraiser also will be used to purchase operational equipment such as food trays, thermometers, thermal bags, scales, and freezers, as well as maintaining those items. Colorado Springs Food Rescue has a 501(c)3 status as part of the umbrella organization Food Rescue Alliance.